How Were China's Top Leaders Selected? China’s state media says the candidates have to meet four criteria. One day after the Chinese Communist Party (CCP) revealed its new generation of top leaders — the seven members of the Politburo Standing Committee (PSC) — China’s state news agency Xinhua published a report elaborating on how the top leaders were selected from the “black box” of CCP elite politics. While it contained lengthy propaganda and numerous ambiguous descriptions, the article still implied the fundamental selection criteria for China’s top leadership: loyalty to the party and to Chinese President Xi Jinping. According to Xinhua, Xi presided over a PSC meeting on April 24 and approved a plan on the selection mechanism for the 19th PSC members. The plan said the 19th PSC members would be selected through “recommendation and direct talk” with some restrictions on age and experience. 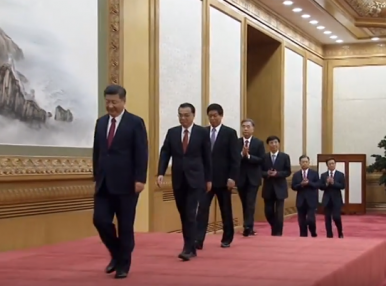 Xinhua disclosed that, from April to June, Xi personally had face-to-face meetings with 57 current and former party, state, and military leaders and consulted their opinions accordingly. Be loyal to the party with resolute faith in socialism, resolutely carry out Xi Jinping’s Thought on Socialism with Chinese Characteristics, and be highly consistent with comrade Xi Jinping as the core of the party as a Marxist politician. Have strong leadership with practical experience, a strong revolutionary mind, reforming and innovative spirit … and outstanding performance. Consciously maintain the central authority and leadership of the CCP Central Committee with Xi Jinping as the core. Have a communist view of the world, of life, and of values, and have excellent style, clean history, higher prestige, and a good image. Particularly, Xinhua mentioned that “the votes for recommended candidates is just a reference, which won’t decide the result” because “excessive emphasis on the votes” had brought about some drawbacks in the past. For example, Xinhua said, “ Zhou Yongkang, Sun Zhengcai, and Ling Jihua had engaged in campaigns, bribes and other non-organized activities to acquire votes” to advance their political careers. Zhou, a former PSC member; Sun, formerly the Party Secretary of Chongqing; and Ling, who was previous President Hu Jintao’s right-hand man, have all been ousted under the anti-corruption campaign launched by Xi. Notably, Liu Shiyu, chairman of the China Securities Regulatory Commission, mentioned that Sun, Zhou, Ling, and other several ousted high officials had “contrived to usurp the leadership of the party and seize power” on the sidelines of the 19th Party Congress. Although Liu’s remarks have been completely deleted from China’s domestic publications, what he said seems to be consistent with the information revealed by Xinhua. Loyalty to Xi is now the defining trait of a successful politician in China.